Supported by consistently high patient satisfaction ratings, the Center for Joint Replacement creates a home-like environment that promotes wellness while maximizing patient recovery with care that is tailored to the individual’s needs. The Paul F. Reinhart Emergency Trauma Center at Hurley Medical Center delivers the highest quality of adult emergency and trauma care in the region. In addition, all patients 65-plus are “fast-tracked” bypassing the waiting room and getting care promptly, regardless of severity of their medical condition. At Hurley Medical Center, we understand how meaningful it can be to send flowers and/or a gift to a patient. The Lobby Shop in our Main Lobby has an excellent assortment of flowers and gifts to choose from. Call to send a gift or arrangement to your loved one at (810) 262-9306. 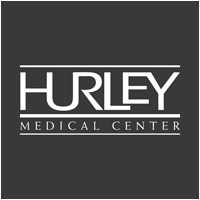 The Adult Emergency Department at Hurley Medical Center delivers the highest quality of emergency and trauma care in the region. In addition, all patients 65-plus are “fast-tracked” bypassing the waiting room and getting care promptly, regardless of severity of their medical condition. In the fall of 2009, Microsoft partnered with Children’s Miracle Network in an online contest that would prove the power of social media here in Flint. Out of 170 CMN hospitals, Hurley received 2,156,400 votes to win a X-Box Gameroom for the pediatric department. Stop by the Hurley/YMCA Wellness Hub located inside of the Flint Farmers Market where you can pick up educational information about various health topics, recipe cards, and more! The Hub also features cooking/fitness demonstrations and special health events each month. The MSU College of Human Medicine building in Flint can be found in the former Flint Journal building. Hurley Medical Center is proud to be a vital component of the MSU-CHM medical education and research system.